The list = FALSE avoids returns the data as a list. This function also has an argument, times, that can create multiple splits at once; the data indices are returned in a list of integer vectors. Similarly, createResample can be used to make simple bootstrap samples and createFolds can be used to generate balanced cross–validation groupings from a set of data. Also, the function maxDissim can be used to create sub–samples using a maximum dissimilarity approach (Willett, 1999). Suppose there is a data set A with m samples and a larger data set B with n samples. We may want to create a sub–sample from B that is diverse when compared to A. To do this, for each sample in B, the function calculates the m dissimilarities between each point in A. The most dissimilar point in B is added to A and the process continues. There are many methods in R to calculate dissimilarity. caret uses the proxy package. See the manual for that package for a list of available measures. Also, there are many ways to calculate which sample is “most dissimilar”. The argument obj can be used to specify any function that returns a scalar measure. caret includes two functions, minDiss and sumDiss, that can be used to maximize the minimum and total dissimilarities, respectfully. As an example, the figure below shows a scatter plot of two chemical descriptors for the Cox2 data. Using an initial random sample of 5 compounds, we can select 20 more compounds from the data so that the new compounds are most dissimilar from the initial 5 that were specified. The panels in the figure show the results using several combinations of distance metrics and scoring functions. For these data, the distance measure has less of an impact than the scoring method for determining which compounds are most dissimilar. The visualization below shows the data set, the starting samples (show as "S") and the order in which the other 20 samples are added. Simple random sampling of time series is probably not the best way to resample times series data. Hyndman and Athanasopoulos (2013)) discuss rolling forecasting origin techniques that move the training and test sets in time. caret contains a function called createTimeSlices that can create the indices for this type of splitting. fixedWindow: A logical: if FALSE, the training set always start at the first sample and the training set size will vary over data splits. As an example, suppose we have a time series with 20 data points. We can fix initialWindow = 5 and look at different settings of the other two arguments. 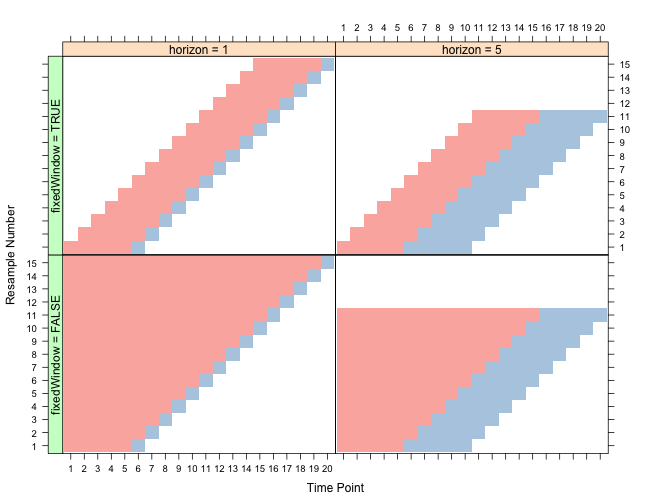 In the plot below, rows in each panel correspond to different data splits (i.e. resamples) and the columns correspond to different data points. Also, red indicates samples that are in included in the training set and the blue indicates samples in the test set. Created on Sat May 31 2014 using caret version 6.0-29 and R version 3.0.3 (2014-03-06).